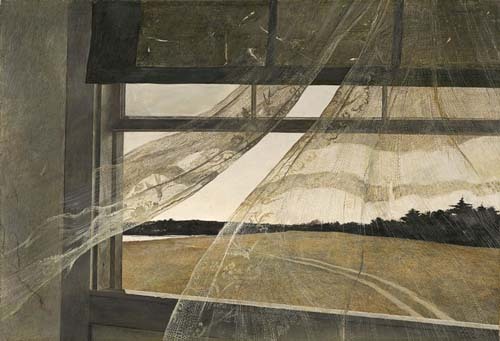 Oh, Wyeth, I thought, I don’t like Wyeth. I had just walked in at the 7th Street entrance, said hello to some Dutch masters, Helen Frankenthaler, De Kooning and Jackson Pollack. And then there was a sign pointing to Andrew Wyeth watercolors. I was familiar with his paintings, admired them for their composition and austerity, but, really, Mr. Wyeth, all these individual brush strokes for dried grass. Hill and hills of brush strokes for dried brownish grass. Oh, well, I shrugged to myself, I’ll just go in and have a quick walk through. My jaw dropped at the sight of the first piece, a pencil sketch he did for Wind from the Sea (1947). 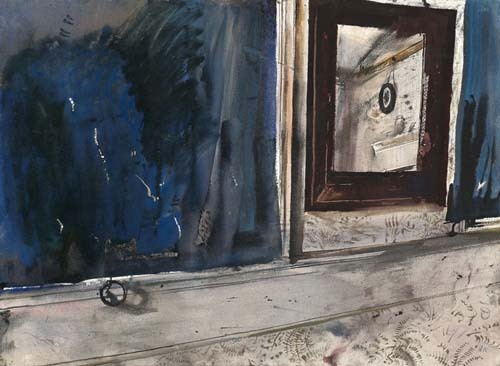 Then he worked out a watercolor of the same motif, the curtain blowing in the window. Oh, my! Some quality, indeed. And yes, he ripped into the heavy paper with a knife or razor blade, he stressed the paper to the point of wrinkling, and the mud was passionate mud. He probably did spit and sweat. Then why are his paintings so, well, fussy. Individual blades of grass, individual threads on torn curtains. Maybe, after breaking loose in a watercolor or two, he got out his tempera and oils to calm himself down. I have no idea how long I was in that gallery. I lost track of time. Drawings and watercolors often don’t reproduce well in art books. The immediacy, the “spit and mud,” is lost in reproductions and prints. What a revelation this exhibit was! It closed two days later. 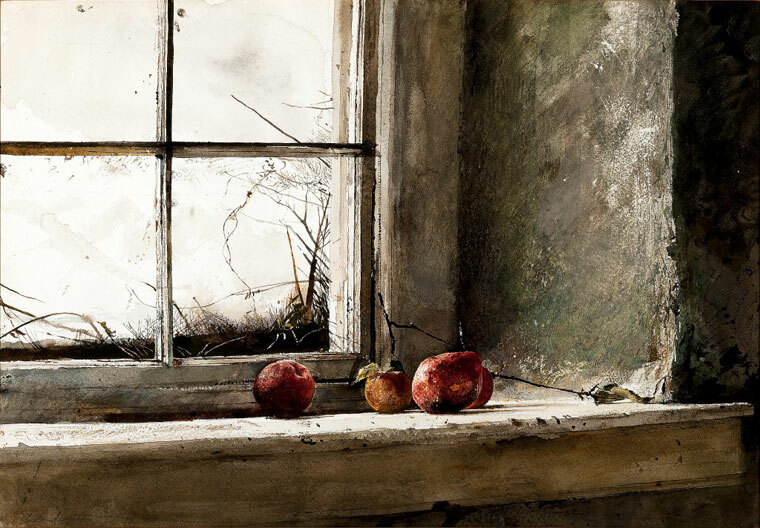 I will hop on a plane the next time someone puts up a Wyeth watercolor exhibit. I do watercolors from time to time, but not enough to be considered a watercolor-IST. But I love looking at them and studying their technique. For me, watercolors fall into two categories: 1) the fussy, goody-goody, neat-huh, look-at-me-I’m-coloring-in-the-lines types and 2) the real thing. A real watercolor makes me sigh. For many reasons, but today I want to focus on just one reason. Namely, a real watercolor lets the white of the paper do half the work. This is difficult to pull off. It requires that you study your subject—hard—before you dunk your soft sable brush into that pot of clean water. One of the tricks of this medium is that in order to make this unforgiving medium look spontaneous and airy, you have to carefully plan your steps ahead of time. In other words, before you start with the brush, you know in what sequence you’re going to apply the colors. And you know where you will apply nothing at all. You plan the omissions where the white of the paper will shine through and make your watercolor look like…the real thing. So you’re in my “Impressions of Landscape” class and you’re set up in the little pavilion on the other side of the parking lot. 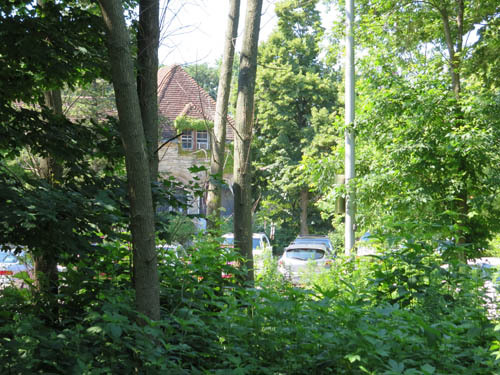 You see the old mansion, the cars and an overwhelming thicket of shrubs and tree trunks. 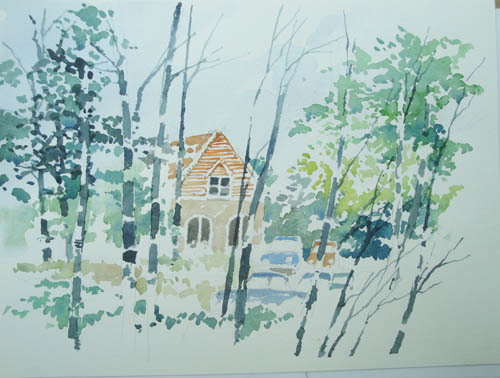 Good grief, how can this become a “spontaneous and airy” watercolor? John Macsai obviously was not overwhelmed. He knew what to omit, what to edit out. To let the tree trunks “breathe” he turned them into dashed lines, which is actually how they look when you notice that all sorts of foliage interrupts their upward sweep. Easier said than done. Notice the restraint in the use of complementary color: greens, blues and sepia. Restraint, both in omission and use of color, is rooted in a love for this medium. It’s not everybody’s choice but in a real watercolorist’s hands, it makes me sigh. John Marin (1870-1954) painted his courageous watercolors in New York and Maine. I always think of the moders as courageous because they were born into the staid, cluttered, dusty, repressed mores and fearful aesthetics of Victorianism and managed to break the bars of that cage. They thumbed their noses at stiff conventions and instead duked it out with the energy of the internal combustion engine, the theory of relativity and the adventure of self-awareness. John Marin rescued watercolor from the lace-fringed hands of genteel ladies and from the “it’s only a preliminary sketch” bin. 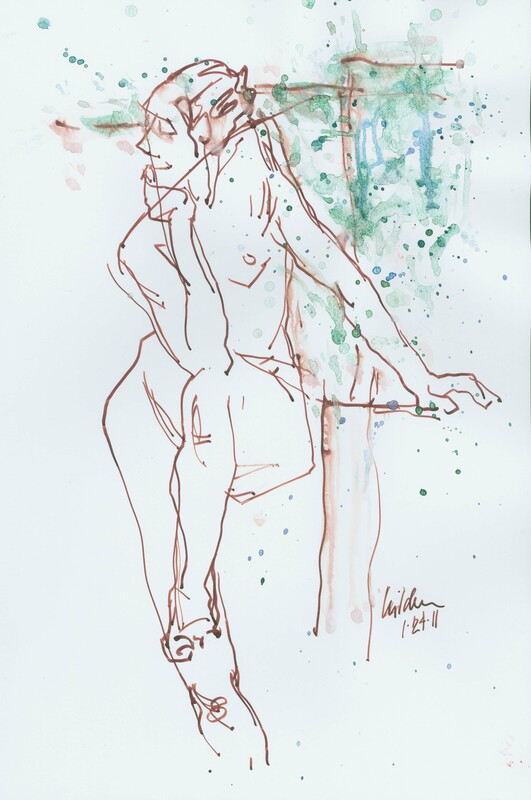 In his hands, watercolor becomes wild and impulsive. His sturdy, rugged watercolor paper looks like a building material and it allows him to drag his wide brush so that the effect is rugged and rushed. No time for pretty, for making nice. This new, modern life offered too many possibilities, too many things to explore and understand. If, while looking at Marin’s watercolors, you start humming George Gershwin, that’s only appropriate. That hustle-bustle of Fifth and 42nd is right there in Marin’s urgent blobs and dashes. In his mid-30’s he moved to Main and studied the sea with the same energetic eye. 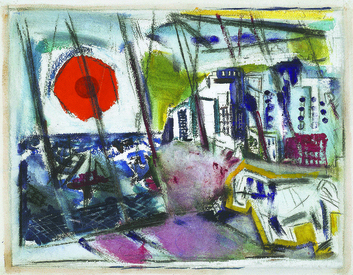 This Sunday, the 17th, will be the last day to catch the John Marin show at the Art Institute. I’m going to see this show again, for the third time, in a couple of days. It’s a Must See. Postpone whatever you need to, but go see the John Marin watercolors…through the glass doors, past the Buddha, on the left….ahhhh…. 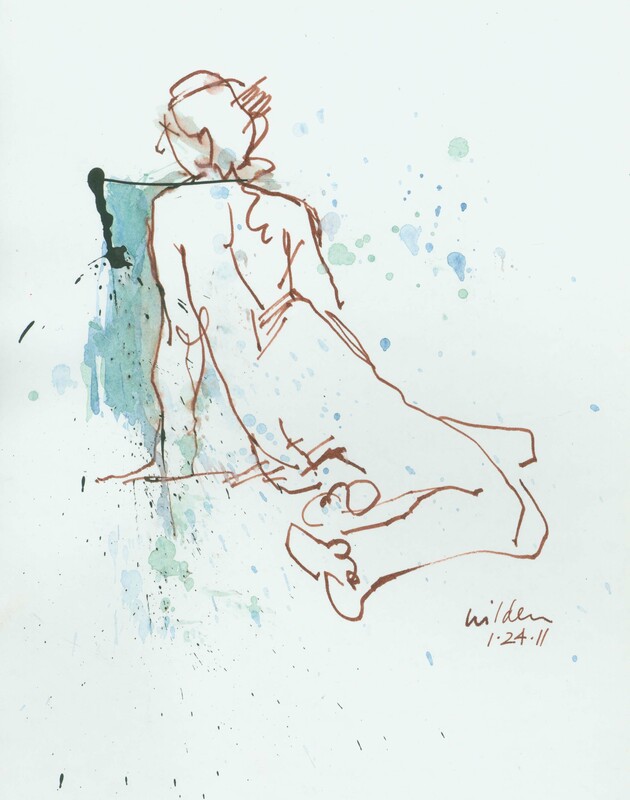 Drawing with pen and ink is liberating (see post 1.29.11) but drawing with a stick is like flying. By stick I mean something like a shish kabob stick. The pen limits you to moving only down or sideways, and if you’re too wild, it will sputter and balk on you. But the humble stick knows no restrictions. It will dance along with you any way you like to move—up, down, sideways, fast and slow. 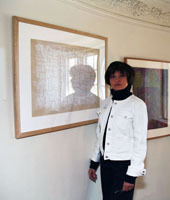 These drawings were made with a stick dipped in non-waterproof sepia ink. The poses were ten to fifteen minutes.